We are spoilt for choice with regular farmers markets here in the Creuse - and are enjoying what the local producers have on offer. From fabulous fresh cheeses to a huge selection of charcuterie. 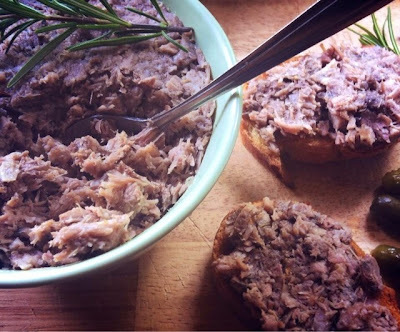 This is my version of duck rillettes - inspired by the local markets and flavoured with star anise and rosemary. I love using star anise with dark meat as it brings out a deep savoury flavour. Serve on crusty French bread with a few cornichons & a green salad on the side...(not sure who I am kidding with the green salad but some people seem to like it!). I have a feeling this may become a house speciality here at De Tout Coeur Limousin. I hope you give this recipe a try and let me know how it goes. I would love to hear about your own charcuterie recipes too. salt and pepper to taste (in the words of Elizabeth David in Provincial French Cooking 'rillettes are insipid if not properly seasoned'. I wholly agree with this statement and do like a bit of salt and pepper in my cooking - but this is of course a personal choice. Transfer the duck legs into a large casserole dish/slow cooker with all the other ingredients. cook on a low heat for 4-5 hours in a slow cooker/casserole or until the meat is tender and falling off the bone. remove the duck legs from the cooking liquid and set aside for a few moments until cool enough to handle. strain the remaining cooking liquid/fat through a sieve. shred the duck meat finely with a couple of forks then place in small ramekins or a larger kilner type jar. 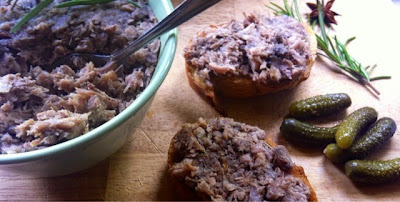 pour some of the cooking liquid/fat over the top of your rillettes and either serve immediately or cover and refrigerate. Remove from the refrigerator for about 30 minutes before serving to allow the rillettes to soften slightly. Check out my recipe for duck rillettes with star anise & rosemary on Love French Food too. Oh I love the sound of this! Those flavours sound amazing and it sounds like the perfect comfort food as the days grow colder. 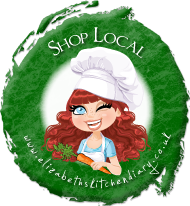 Thanks for linking up with Simple and in Season and Shop Local!